Those Britons who are able to puff up their chests with pride at the thought of an age when half the globe was coloured pink would surely feel a stiffening in the upper lip at the sight of the Redcoats as they re-enact the movie Zulu by interacting with stock footage animals and Mondo style documentary footage of natives, some clearly wearing later twentieth century dress, before going to battle with a load of extras in poorly applied blackface. Richard Harrison leads and Umberto Lenzi directs what could possibly be the most fun Italian combat feature ever made. 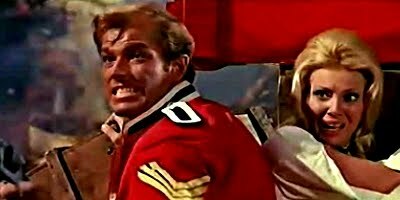 By no means always played straight Three Sergeants of Bengal does keep it light and in execution feels, at times, more like Carry On Up The Khyber than Zulu. A cunning ambush plan, with a complexity to rival the boardgame Mousetrap, is executed and a retreating enemy is massacred to the sounds of heroic music as featherweight barrels and sandbags get tossed around in the mayhem of battle. Jaw dropping yet ultimately priceless.